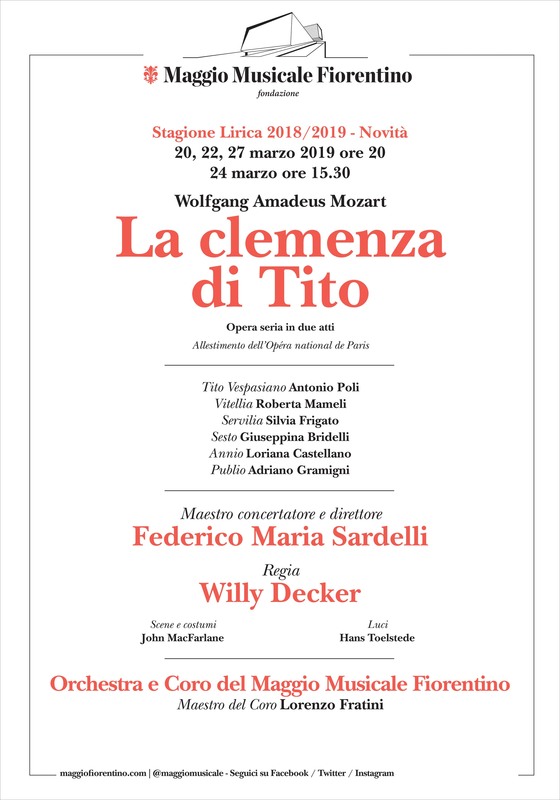 La clemenza di Tito is an Opera Seria composed specially by Mozart in celebration of the coronation of the Grand Duke of Tuscany Leopold II of Augsburg as King of Bohemia on November 15, 1790 at Pressburg. The opera was prepared in time for its debut at the National Theatre of Prague on 6 September 1791. In homage to the illuminated sovereign, the choice went to a solemn theme, put to verse in 1737 for Charles VI, the grandfather of Leopold, and previously set to music at least forty times. But times and musical tastes had changed, and the old and venerated libretto by Metastasio was subjected to a revision by the poet Caterino Mazzolà on the specific request of Mozart. It was reduced from three acts to two, freed of many recitatives, and the transformation of a number of arias into ensemble pieces. The result is a masterpiece in which the stylised characters of the late baroque opera once again come to life, and the protagonist Titus emerges even further in his status as a sovereign who is wise and totally devoted to public good.